The electronics and semiconductor sector is considered as one of the primary foundations of the global economy. The industry is characterized by high degree of competition and intensive research and development analyses so as to offer better quality products. The market is globally driven by a rising demand for specialized IT hardware, professional automation products, and consumer electronics such as mobile phones. Our market research reports for the semiconductor and electronics industry provides 5-year forecasts on topics such as intelligent lighting, internet of things (IoT), sensors, silicon photonics, augmented reality, and more. 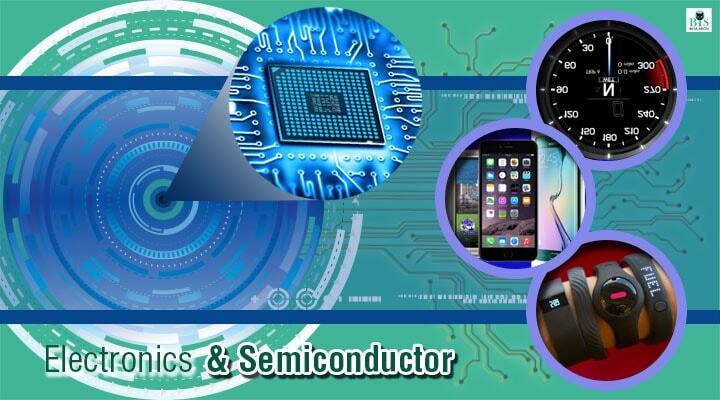 Research studies done by BIS Research on electronics and semiconductors focuses on essential verticals such as defence, consumer products, healthcare, industrial and commercial services. The global FinFET market is expected to witness a significant growth during the forecast period (2018-2023) registering a CAGR of 16.10%. Global Wireless Charging market is expected to witness a significant growth during the forecast period registering a CAGR of 40.97% and 37.34% in terms of volume and value respectively. According to BIS Research analysis, the global eSIM market generated $214.7 million in 2018 and is estimated to grow at a CAGR of 40.70% during the forecast period 2018-2028. The global Li-Fi technology market is expected to grow at a CAGR of 71.2% in terms of value during the forecast period 2018-2028. The global solar LED street lighting market is expected to grow at a CAGR of 16.5% in terms of volume and 13.2% in terms of value during the forecast period 2018-2024. The global market for silicon photonics devices has been tracked along the lines of its products, components, application areas, and geography. The global lighting as a service market is expected to grow at a CAGR of 40.8% in the forecast period 2018-2025. The global HCL market is expected to grow with a CAGR of 37.2% and 35.2% in terms of volume and value, respectively during the forecast period 2018-2024. The intelligent lighting controls market is expected to grow at a significant rate during the forecast period, (2018-2024). This is due to the integration of physical security industry with intelligent lighting, changing paradigm of lighting control industry to electronics industry and adding voice control feature to the upcoming products. The augmented reality and mixed reality market is expected to transform all the present major industry verticals, while growing at a CAGR of 65.1% and 72.0% respectively, during the forecast period (2018-2025). The global UV LED market is currently being dominated by UV-A LED with a market share of 52% in terms of value. However, the high growth in UV-C LED is expected to drive the growth cycle for the UV LED market in the coming years, and UV-C is expected to attain the highest market share by 2023. The LED lights market has undergone significant transformation in the last couple of years. The Energy Independence and Security Act (EISA) passed in 2007 led to a major change in the lighting industry as it replaced the outdated inefficient lighting technology. The global silicon photonics market was estimated at $492.18 million in 2015, and is expected to grow at a rapid pace of 20.34% over the forecast period 2016-2022 to reach $1,676.10million by 2022. The growth in silicon photonics market over the period 2016-2022 is expected to be primarily supplemented by factors such as increasing demand for huge data transfer; rising demand for higher bandwidth and increasing support by government for adoption of silicon photonics technology. The quantum dots market is estimated to reach $7.8 billion by 2022 at a CAGR of 46.4% through the forecast period. Quantum dots witnessed a major increase in adoption rate for the usage in various applications due to several advancements offered by the technology. The quantum dots market is expected to grow at a significant rate during the forecast period. In terms of percentage share of different types of sensors being extensively used in Internet of Things (IoT) connected devices, pressure sensors accounted for maximum in 2015 of 31.27%. The global advance energy storage market was worth $28 billion in the FY2015 and is expected to grow at a standard rate during the forecast period of 2016-2022. Some of the major technologies in the advance energy storage market are growing rapidly in regions such as North America and APAC while many others are still at a nascent stage and expected to develop in upcoming years. The FinFET technology market is estimated to reach $32.74 billion by 2022 at a CAGR of 28.6% through the forecast period. This growth in the FinFET technology market is due to the increasing IC industry which is providing ample growth opportunities to the FinFET technology market. The global high speed camera market is worth $326.96 million in the FY2015 and is expected to grow at a decent rate during the forecast period of 2016-2022. The market has matured in developed regions such as North America and Europe and is gaining maturity in the APAC and Latin American region. The global LED emergency lighting market is expected to grow at a significant rate during the forecast period. This is due to factors such as the integration of security industry with LED lighting, changing the paradigm of lighting industry to electronics & healthcare industry, and continuous advancement in upcoming product range. The global AR and VR market is estimated to witness growth at a CAGR of 85.4% and 44.5% respectively over the period of 2016 to 2022. This growth rate is expected due to increase in the awareness about these technologies among the consumers, mass scale adoption of AR and VR in various industry verticals, and integration of AR and VR to create mixed reality for future applications. Increasing acceptance of smart phones as a source of entertainment among the consumers and rising expenditure on semiconductors for wireless devices are enhancing the rate of growth of the global wireless audio device market. High performance computing (HPC) technology market was incorporated in 1960 for high end scientific computations, and is currently playing a crucial role, not only for the research community but also has spread its hold among big businesses, academic institutions, government agencies, small and medium enterprises (SMEs) among others. The context behind the development of explosion proof equipment can be traced back to 19th century, which saw the upsurge of usage of electrical equipments. It was a time of bitter experience in the form of firedamp explosion that lead to adoption of high standards of safety in electrical equipments.